pseudoparanormal: The 13th Floor: Sinister realm of evil and deviance, or just silly superstition? The 13th Floor: Sinister realm of evil and deviance, or just silly superstition? Have you ever noticed that some elevators are missing a button for the 13th floor? This is no accident; the Otis Elevators company has reported that about 85% of all buildings in America omit the 13th floor from elevator service, or designate the 13th floor a different floor number. So, what’s the big deal surrounding the 13th floor? 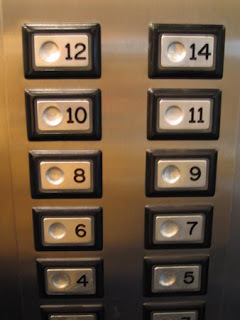 As we all know, the number 13 is considered unlucky, the 13th floor in a building is no exception to this widely held superstition. Triskaidekaphobia is the fear of the number thirteen. The fear of the number 13 and all of the evil and misfortune that many believe the number brings is at the root of this myth. Many building owners and construction firms deliberately leave the 13th floor of many high-rises unfinished or use them for the buildings mechanical needs and purposes, this is done out of fear of losing superstitious tenants and customers. “A fear of the number 13 costs America over a billion dollars a year in absenteeism, train and plane cancellations, and reduced commerce on the thirteenth of the month” --Superstitions, by Suzanne Lord. There are many myths and theories surrounding the thirteenth floor. For example, many people believe that the thirteenth floor in government building is inhabited by secret government agencies that are conducting clandestine operations or observing sinister events and phenomenon. It’s very interesting how out of fear and superstition, we overlook common sense and logic. As discussed above, building owners and construction firms simply just change the 13th floors designation to another number. It is believed that this simple re-arranging of numbers is enough to confuse evil spirits and prevent misfortunate incidents from occurring. 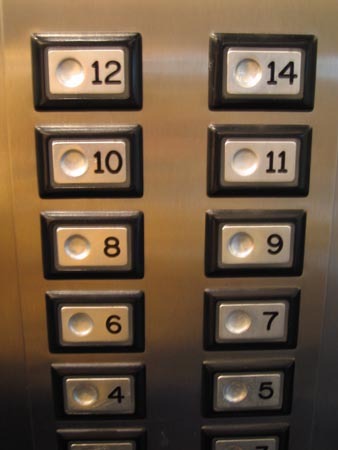 The 13th floor is the 13th floor even if you change its number to 12a or 14. Logic takes the back seat to hysteria and superstition. I think that this myth is really funny. Despite its seemingly humorous content, it obviously is taken very seriously. I used be to be slightly weirded out by the number 13- but my dad has lived in an apartment numbered 13 for a few years now, so I have kind of gotten over the silliness of the superstition. Its amazing what lengths people will go to in order to respect the "power" of superstition; always fearing the unknown.